Regular maintenance at Early American Auto Repair will help to maintain your vehicle for many years without costly repairs. We service individual vehicles and collections both on & offsite. Your vehicle is one of the most important purchases you will make and may be one of only a few in existence. We serve auto enthusiasts in Virginia, Maryland, West Virginia, North Carolina, Ohio, Pennsylvania and much of the Mid-Atlantic. It makes good sense to have periodic auto maintenance and tune ups to keep your vehicle running smooth. That’s why we offer a wide variety of vehicle maintenance services. A preventive auto maintenance program is instrumental in reducing and avoiding costly repairs, and keeping your antique or classic vehicle safe, reliable, and in proper operating condition. 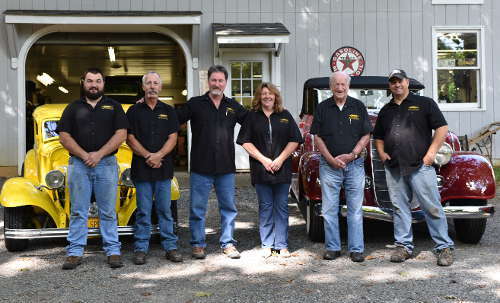 Early American Auto Repair is locally owned and operates in Berryville, VA. Our business is based on the simple idea that we treat customers the same way we all want to be treated: with honesty, competence and respect. Contant us for all of your auto maintenance services (540)533-8185.